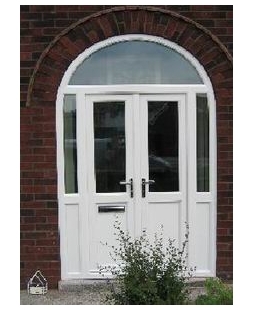 Value Doors offers Arched Frames that wonderfully transform the external appearance of your home. We understand that sometimes it can be hard to find Front Door installers and companies that can adequately deal with the unique challenges associated with Arched Frames. That’s why Value Doors offer a bespoke service that revolves around making sure your entrance requirements are successfully met. The vast design range of our Arched Door Frames ensures that you are sure to find the Front Door of your dreams at Value Doors. At Value Doors we offer multiple Arched Frames options that leave you feeling spoilt with choice. No matter whether you choose an Arched French Door, Arched Composite Door of Arched uPVC Door, the style of our Arched Front Doors provides your home with added value and solid security. 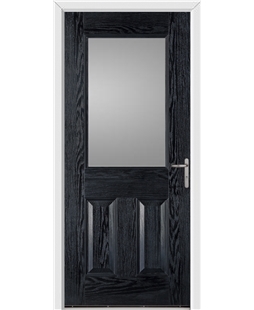 Every door you see on our website, no matter if is a composite or uPVC, can be installed as a back door or front door. However, some may be more suitable than others, considering the slightly different requirements you may have for your rear entrance. To make choosing your new composite or uPVC back door as simple as possible, we have compiled our most popular external back doors on this page for you to view easily. Our uPVC Doors range, Composite Doors range, uPVC & Composite Stable Doors range and Steel Doors range all make perfect back doors as well as our uPVC or Composite French Doors and uPVC Patio Doors range. All of our door designs that you can view have a variety of reasons to why they make great external back doors, your choice simply depends on your personal style and door needs. If you need an external back door that increases the security of your home, then you need to view our Composite Doors. Not only will our Composite Doors make your home secure, they also come in a range of colours, designs and are super stylish. So why not view our Composite Doors today! 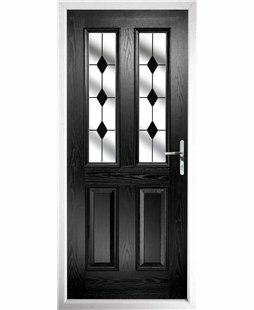 Our uPVC Back Door designs are extremely popular thanks to their diversity and ability to be a solid door or fitted with different glass glazing panels designs. By also being incredibly affordable and low maintenance, for some, uPVC Doors make perfect external doors. Our Stable Doors designs are even available in Our uPVC or composite range! Every external door that we manufacture whether it be uPVC or Composite has a design that ensures it is as secure and thermally efficient as possible, which is why all the glass used within any of our doors is double glazed safety glass. Meaning all of our uPVC and Composite double glazed back doors will not only help keep your home secure but will also help keep it warm. 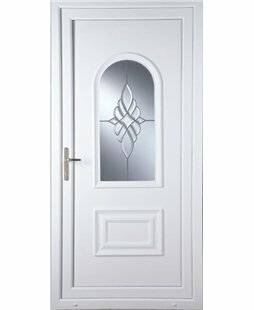 As with all of our external doors and uPVC windows that we feature on our website, included within our external uPVC and Composite back door prices is the measuring and fitting of the door, as well as the VAT and a free 10-year insurance backed guarantee; We also have a range of accessories that you can add to your door. We have installers placed throughout the UK, so no matter where you are, our professional installers can fit these doors for you. View our external uPVC and Composite door range today and you will find your perfect door! With a huge range of external uPVC and composite back door designs to view and choose from you may be spoilt for choice. If you need any help or have any questions when it comes to choosing your new back door, then please don’t hesitate to call us for free on 0800 955 0898. Bifold Doors are the perfect Back Door option for homeowners wanting to create a flowing space between their home’s inside and outside areas. With the full glass panels of our Bifolds enabling you to admire the wonderful view of your garden or rear entrance from the comfort of your home. 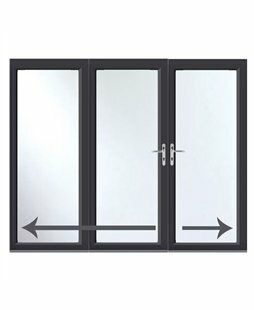 Our range of Smart Aluminium Bifold Doors are incredibly stylish and come in 7 different opening styles. Available in 2 RAL colours, Grey and White, a sliding Bifold Door from Value Doors guarantees to revitalise the appearance of your entrance. The design of our Bifold Doors prioritises ease, with their folding function allowing you to effortlessly access your garden. Our Bifold Doors are extremely neat and compact, as their panels fold from one side to the other and collect together in one corner. The addition of a Bifold Door offers your home added value and solid security. Bifolds are expertly manufactured with your safety in mind and adhere to strict British security standards. Improving both your home’s internal and external appearance, a Bifold Door from Value Doors will provide your home with a beautiful focal point for many years to come. sealed units both reduce energy loss and increase your doors ability to block out any outside noise. Our Bifold Door prices include free measuring, fitting and VAT. Each style of our Front Doors and Back Doors also comes with a 10-year insurance backed guarantee. For more information, feel free to call us on 0800 955 0898, where a member of our friendly customer service team will happily answer your questions. Knockers, spy holes, letterboxes, numerals...Door Furniture is the easiest way to personalise your door and ensure it stands out on your street. For those with animals, we have a select range of cat flaps available and if you require an exit for your dog, we are also able to accommodate. Just contact us with your requirements and we will be happy to help. Our installers have brochures containing all the Door Accessories available for your new door. So be it a striking door knocker, a lovely letterbox or a sneaky spy hole to see who’s there, your local Value Doors fitter will be more than happy to show you the options available. We know you want to keep your home protected, even from accidents like house fires. With our FD30s Fire Doors, you are. Made with only the highest quality materials and built to the highest standard, our Fire Doors aren’t typical doors, they have been engineered with your safety in mind and manufactured as the optimum safety defence against fire. Due to current fire regulations, Gloucester, Richmond and Warrick FD30s Fire Doors are the only models available at this time. Our FD30s Fire Doors comply with all UK FD30s regulations and ours have additional cold smoke seals to mitigate against the spread of smoke for a minimum of 30 minutes. The clue is in the name with these FD30s Fire Doors, they are accredited for 30 minutes but, ours surpassed this time by a further 10 minutes. During a fire, intumescent strips foam and swell, filling the gap between the door and the frame making sure smoke is contained. A 44mm multilayered particle board panel is coated by a 3mm thick uPVC Skin, to add further protection in the unfortunate event of a fire. You may think that because of the safety aspect that FD30s Fire Door’s cover, they would have conservative looks and be plain, that’s not the case! When you buy a Fire Door from Value Doors, you can choose between 7 different external Fire Door designs and 9 different colours; White, Black, Blue, Green, Foly Green, Oak, Grey, Red and Rosewood, (we also fit internal FD30s Fire Doors if you live in a flat). Due to the 7.5mm thick Glaverbel pyrobelite, fire resistant glass, 4 of our door designs are also available with glass options. This means you can opt for a door with glass that is double glazed, or you can have a solid panel door, just take a look at what we have to offer! 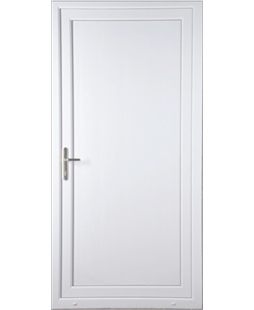 The price of our FD30s Fire Doors includes the overhead closer, which is a legal requirement for all Fire Doors. If you need any help with our FD30s Fire Door range, feel free to call our customer service team on 0800 955 0898 who will be more than happy to help. French Doors are a fantastic option if you're looking to brighten up your home; enabling more natural light to flood in and giving you ease of access to your patio or garden. Whether you want to bring the outdoors in or simply sit and admire your beautiful garden, Patio and French doors are perfect. At Value Doors UK, our stunning range of sliding Patio & French Doors allow you to create a sophisticated living space whilst, as always, offering a wide range of styles and finishes. With additional decorative features, you have the perfect opportunity to create a French Door with individuality and personality that's tailored to your precise requirements. Add style, depth and added resale value to your house with our Patio & French Doors - all with high security claw locking systems for your complete peace of mind. Take a look at our Rockdoor French Door range to see the ultimate French Door; they are the only French Doors in the UK to have achieved Secure by Design accreditation, an official UK Police flagship initiative. Our range of uPVC Patio and French Doors have VAT and installation are included in the price of every door - the price you see is the price you pay. You're also covered by our industry standard ten year guarantee. Interested in Patio and French doors? Click below and browse through our ranges to find your perfect match. Alternatively, give us a call! We’re always happy to help. At Value Doors we don’t just take pride in the quality of our doors for houses, we also apply the same quality to our Garage Doors, Shed Doors and Outhouse Doors. We know how important security can be when it comes to garages, garden sheds and outhouses, which is why we don’t treat them any differently to a residential door, the same virgin uPVC is used for the panels and frames. Thanks to this, your new door comes with exactly the same benefits as your uPVC Front Door meaning it is has a 6-point locking system, is UV stabilised so it won’t discolour in the sun and is low maintenance. We are a proud nation. We are proud of our achievements, proud of our homes and for many of us, taking pride in our gardens is a must. Our range of doors for exterior buildings will give you what is missing from your garden. If you are looking for something that will spruce up the look of your front or back garden, our Shed, Outhouse and Garage Doors are perfect for you. Please click 'read more' below, to find out about these products. Do you have a free-standing garage? Our range of Garage Doors is ideal for homes with such a garage. They will transform the look of your property, making the entire appearance fresh and sleek, all thanks to a new Garage Door. If your garage is connected to the side of your home, a Fire Door needs to be installed at the entrance point leading to the garage (we sell these too!). We love our high-quality pedestrian Garage Doors and we know you will too meaning you can enjoy the highest quality new Garage door from us. Whether you are looking for a garden Shed Door, Garage Door or Outhouse Door, you will be pleased to know that they all come in styles and colours that suit exterior buildings as opposed to the styles we have available for Front and Back Doors. Quality is never compromised with any of our doors which is why we ensure our customers get the quality product at a right price. If there is anything else you need to know, please don’t hesitate to call our head office today for a chat or non-obligatory quote! For more information on our sectional Roller Shutter Garage Doors, click here to read our blog. Here at Value Doors UK, we appreciate that you want your home to be as protected and secure as possible, which is why we have created a uPVC High Security Door range. These doors are manufactured with security in mind, meaning that all of their components, from their locks to their door panels will help defend your home. For your protection, this door comes complete with a 10 pin anti-snap, anti-bump, anti-drill, anti-pick lock, a high security locking system including 3 claws and a full 1 piece lock keep. As well as a 28mm MDF or plywood reinforced uPVC panels, box section galvanized steel reinforced frames and toughened safety glass. As with our standard uPVC Door collection, our High Security uPVC Door range will also provide you with the same freedom to personalise your new door. In fact, the only difference is the additional security measures that our High Security doors offer. Meaning that these security doors are available in 3 different colours (White, Oak and Rosewood) and in over 170 beautiful design. To make the maintenance of your Security Door as easy as possible, our uPVC Door frames are UV stabilised. Which means that these doors will only require a wipe down with a damp cloth to keep them looking like new. As with all of our uPVC Doors, Composite Doors and Windows, included within our High Security uPVC Door prices is the measuring and fitting of the door, as well as the VAT and a 10-year insurance backed guarantee. We have installers placed throughout the UK, so no matter where you are, our professional installers can fit these doors for you. Stable Doors are the ultimate door, perfect for anyone! If you are looking for a door that is secure, lets in lots of natural lights and is visually stunning (and who doesn’t), a Stable Door offers all of these and more. At Value Doors, our Stable Doors operate in two ways, you can use them as traditional doors where they open as one, or you can have the bottom half locked with the top open meaning ample amounts of fresh air and light can enter your home. Stable Doors are ideal if you have small children and pets who you need to keep indoors whilst enjoying all the benefits of essentially having your door open! It’s a win-win situation. 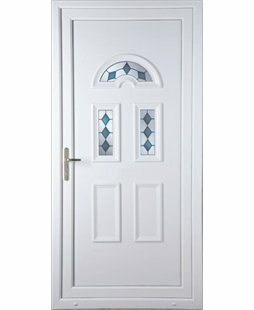 Here at Value Doors, we have ranges of Stable Doors suitable for any home, style or price range. Staring with the industry-leading Rockdoor Composite Stable Doors to our own, uPVC Stable Doors manufactured at our factory in Leeds, we have you covered in the Stable Door department. Stable Doors work perfectly as Back Doors and there is nothing that quite meets the high standards of Rockdoor Stable Doors. With over 20 years of driving force behind the Composite Door technology, Rockdoor know what they are doing when it comes to making secure, stylish and thermally efficient doors and their Stable Doors aren’t any different. Rockdoor claim that their Composite Stable Doors provide ‘charm and convenience’ and that is very true, for example, one Rockdoor Stable Door that was installed on a coastal property on the Isle of Man 20 years ago is still going strong to this day! It is hard to deny how Rockdoor Stable Doors exceed in every aspect of a door, 60% stronger than Composite Doors, Rockdoors Doors are manufactured using carbon fibre and nickel-coated solid brass hook locks. If it is security that you are concerned about when considering a new Front Door or Back Door, a Rockdoor Stable Door is for you. Thanks to their S-Glaze design which means the glass in the Rockdoor is bonded to the door during manufacture and its specially-coated and double-glazed means absolutely no air can pass through. At Value Doors we are very proud to be a trusted installer for Rockdoor where we will deliver the highest quality Composite Stable Door matched with the same, equally high customer service and installation. 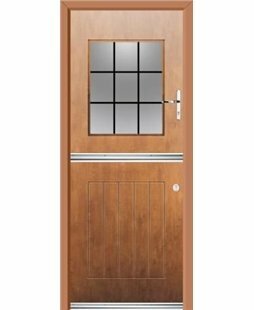 Available in White, Rosewood and Oak, we manufacture uPVC Stable Doors that are secure, thermally efficient and stylish. If you are looking for a Stable Door that will save you money in your pocket without compromising on quality, uPVC Stable Doors are a great choice. Every door we make at Value Doors is completed to the highest quality by our skilled fabricators. As our Stable Doors are manufactured at our factory in Leeds, we can conduct strict quality control checks on every door so we know we are giving our customers only the best. 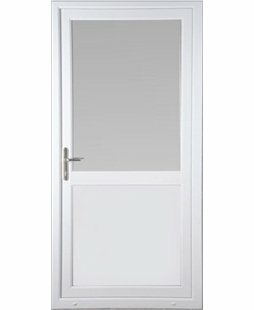 Our uPVC Stable Door range comes with fitted toughened safety glass as standard and a multipoint locking system. We do also offer a High-Security range of our uPVC Stable Doors which are installed with a 5 pin anti-bump, anti-drill, anti-snap, anti-pick lock along with a 10-point locking system! Stable Doors are perfect for those of us who want a door that provides ease to our everyday lives, and both of the Stable Doors discussed will give you this little bit of luxury. With a stunning view down your garden from your new Stable Door, you will wish you had made the change sooner! Staying true to ourselves at Value Doors is very important to us and at Value Doors we value our customers which is why, as with all of our uPVC and Composite doors, you receive measuring, fitting, VAT and a 10-year insurance back guarantee in your price. Thanks to their remarkable security features, Steel Doors are some of the most secure doors available on the market. Here at Value Doors UK, we offer a range of robust steel doors that make perfect heavy-duty commercial and industrial security doors as well as others that provide durable emergency and fire exits. Unlike wooden doors, our steel security doors have incredible endurance, will only require minimal maintenance and will never crack or warp. This is thanks to steel being a durable, high quality, sturdy material that is also used to create parts of buildings, ships and cars. The strength of our high security doors is the reason why they are a great solution if you are concerned about the security of your commercial property. Each component that makes up our range of Steel Security Doors and their frames is built with security in mind. From the 2 steel strengthening structural supports that run through this 50mm thick door, to the multi-point drill and impact proof locking system, this door has been created to stop any intruders getting through. 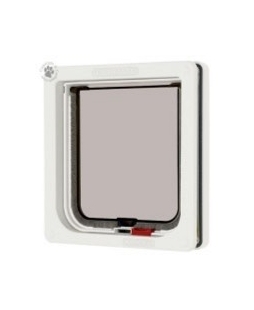 To help offer both thermal and acoustic resistance, these security doors are also filled with fibre glass material and have full weather seals. If you are required to have a fire exit in your commercial property, then you need a Steel Fire Exit Door from Value Doors UK. These heavy duty security doors will not only provide an emergency exit, they also provide excellent security and are made using the highest quality CE marked products. They are also vigorously tested and are proven to achieve the highest standards in both security and quality. 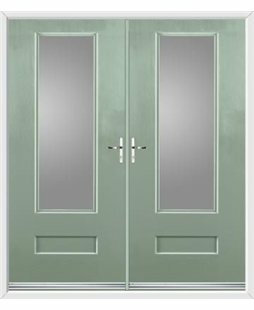 These range of doors features shoot bolts, a drill and impact proof multipoint locking system and a 50mm thick door leaf that is strengthened by steel supports. We have installers placed throughout the UK, so no matter where you are, our professional installers can fit these doors for you. By combining the practicality and security of uPVC with the character and charm of traditional timber sash windows, uPVC double glazed sash windows from Value Doors UK make the perfect window for any home. All elements of these windows, from the stylish hardware to the popular designs, have been engineered to resemble traditional timber sash windows, whilst remaining secure and thermally efficient. Not only do these windows look great, they are also extremely easy to use and have been constructed with extra security measures for your peace of mind. A stylish sash window is fitted with sash locks and a security bar that is designed to stop intruders using tools or excessive force to gain entry into your home. The high performance, 24mm thick, double glazed glass units that these windows are fitted with create optimal thermal efficiency and have achieved an energy efficiency rating of A. Therefore, a sash window could save you money on your energy bills and help keep your home warm. These double glazed windows can also be fitted with a collocation of privacy glass, which helps create a perfect bathroom window. Our beautiful uPVC sliding sash windows will never rot, rust, peel or flake like tradition wooden windows. The only maintenance they require is a wipe down with a damp cloth to keep them looking as good as new. Thanks to an inward opening tilt facility you will never have to leave the comfort of your home to clean the outside of these sash windows, which is particularly useful for those windows that are in hard to reach places. Our authentic, timber looking double glazing sash windows are available in a range of popular styles and in a total of seven different colours which include White, Oak, Rosewood and Chartwell Green. With a range of privacy glass designs and traditional hardware options also being available, a sash window can be personalised to suit any property. The maximum height of a sliding sash window is 3000mm, with a maximum width of 1600mm. The minimal height and width of these stylish windows is 740mm x 340mm. As with all our doors, our sash window prices are shown for each product. 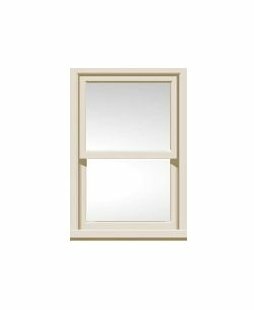 We also have a uPVC Casement Window range that you can find here. Please contact our experienced window team for free on 0800 955 0898 if you need any help with the selection your perfect sliding window, or if you wish to know more about our timber style windows. Here at Value Doors, we also install stunning, high-quality uPVC double or triple glazed Windows. These glazed glass windows have a simple yet stylish design, which has helped them become increasingly popular around the UK. As they are also affordable, strong and energy efficient, double or triple glazed windows can be seen as a lasting investment to any home. Not only do these beautiful uPVC Windows help improve the security and style of your home, they are also thermally efficient and can help reduce your energy bills. Unlike traditional timber windows, our double glazed uPVC windows are specifically built to reduce the amount of cold air that enters your home. 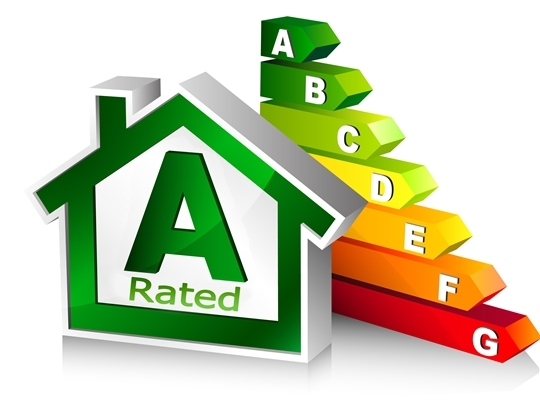 An energy efficiency rating of A, is achieved by using energy efficient glass that has a Soft Coat Low-E coating and is filled with Argon gas and warm edge space bars. As with all of our products, we manufacture all of our uPVC Casement and Sash Windows at our head office in Leeds. By being a corporate member of both FENSA and Certass, you can be assured that both our products and installers are of the highest quality. Here at Value Doors UK, all of our Casement Windows with all current UK Building Regulations. Our uPVC Casement Windows can be personalised to suit any property as they are available in a range of popular designs, and in a total of seven different colours which include White, Rosewood and Anthracite Grey. To help comply with your privacy needs all of our windows can also be fitted with a collection of obscure privacy glazing options. Our uPVC Windows can even be installed with Integral Blinds, which help protect your privacy and control the amount of light and shade entering your home. Our double glazed Casement units offer outstanding value for money, with the installation, removal and recycling of your old windows, as well as the VAT and a 10 year, insurance backed guarantee all included in the price. With the choice of your new window being fitted with either double or triple glazed glass style units, it depends on your homes needs to which you choose. For most homes, a double glazed window is an affordable choice that provides maximum benefits. However, if you want windows that outperform double glazed units then you should choose a window fitted with triple-glazed glass. 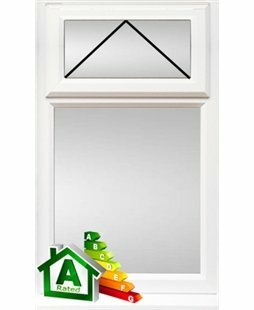 To find out more about our triple and double glazing prices please call our team on 0800 955 0898. We also manufacture and install traditional finish uPVC Sash Windows. Please Note: The products shown are just some of the window styles we manufacture. If you can't see the window style you are looking for it doesn't mean we can't do it. Please call us for free on 0800 955 0898 for more details.